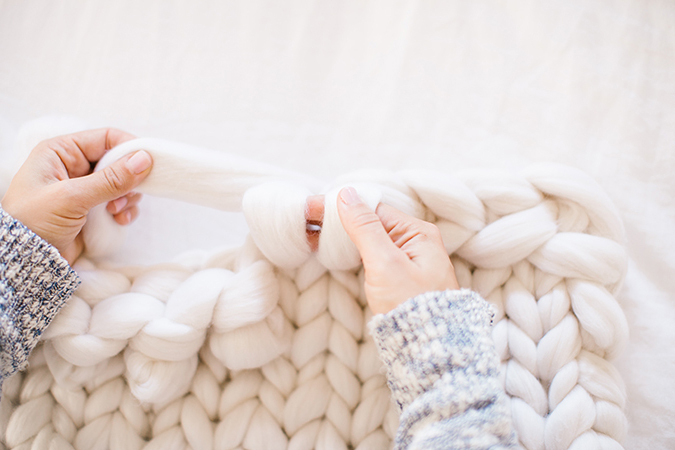 If you’ve spent any time on Pinterest this year, you’ve probably seen some beautiful chunky knitted blankets pop up here and there. 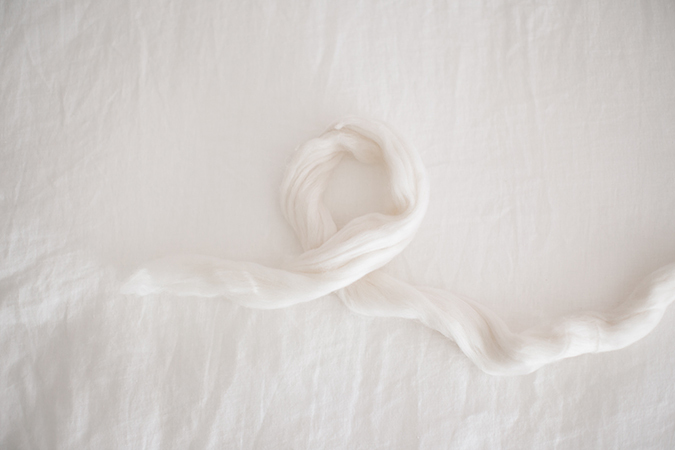 You know, the kind of blanket that looks like it’s made out of clouds and is usually strewn across a very photogenic bedspread. I know that the first time I laid eyes on one, I was instantly smitten and knew that I wanted one on my own bed as soon as possible. So I decided to do a little research and I have to admit, I was slightly disappointed in how expensive all of the pre-made blanket options were. That got me to thinking, why couldn’t I just make my own? 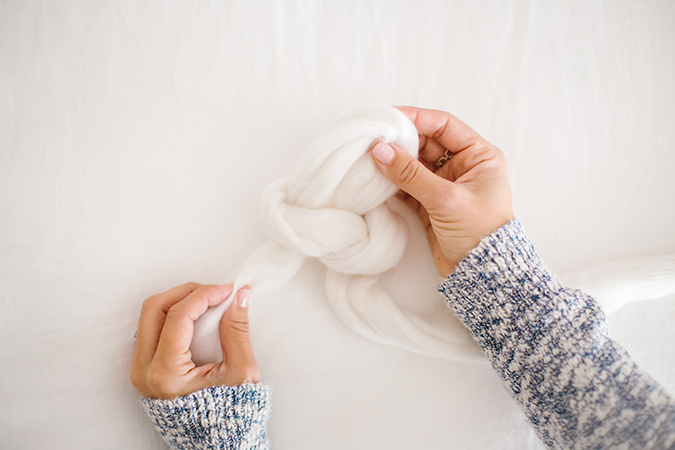 After going through some trial and error to find the right kind of yarn, I finally found the perfect merino wool and YouTube tutorial to get me on my way. Over the past few months I have made a handful of my own chunky hand knitted blankets in various sizes. Ever since I shared one of my blankets on Instagram, I’ve gotten countless inquiries of where I bought the blanket and how I made it. 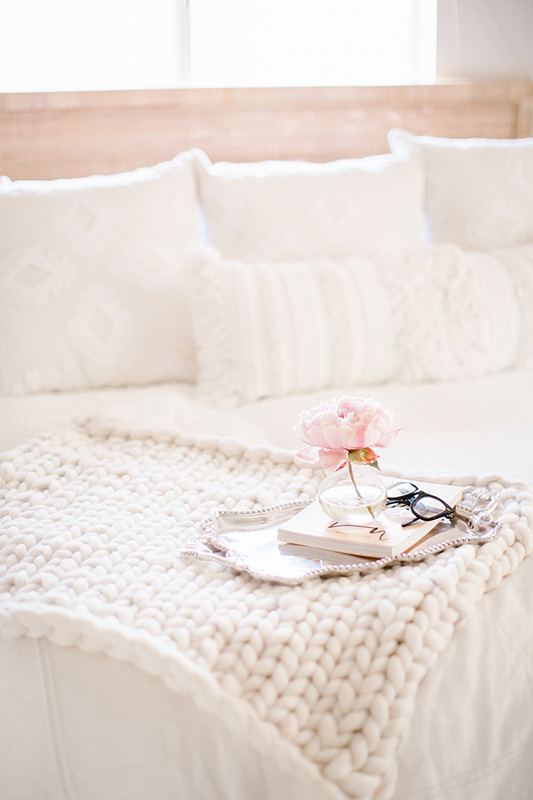 Today I thought I’d share my knowledge with all of my LaurenConrad.com friends so that you too can have your own perfectly fluffy work of art. 1. 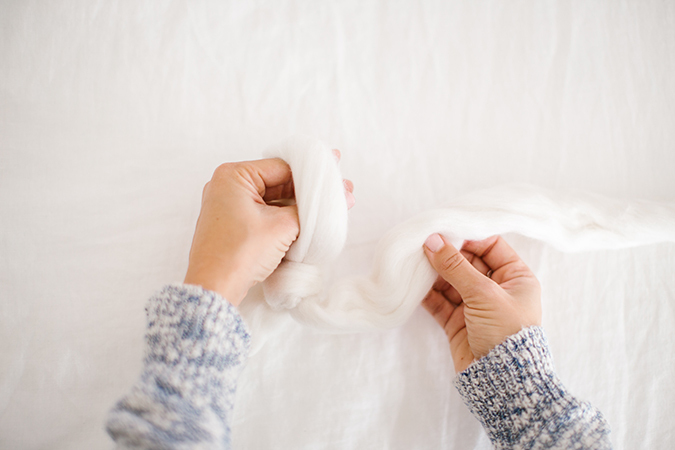 Begin by unraveling a decent amount of your merino wool. That way you have enough wool to work with without having to tug at it, which can cause it to break. 2. First, you must cast on. 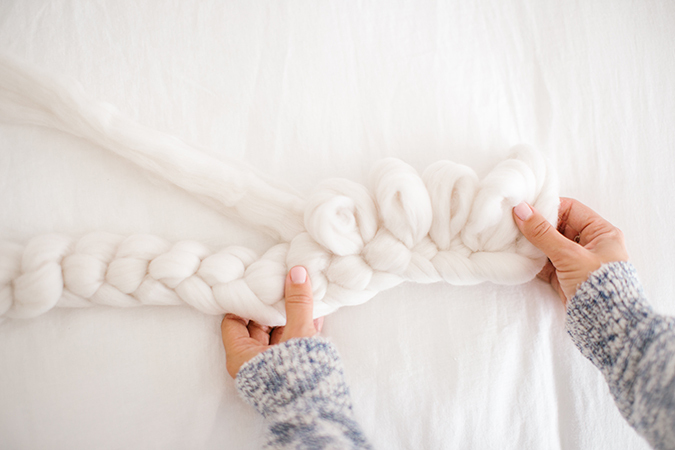 To do this you make a loop at the end of your wool. 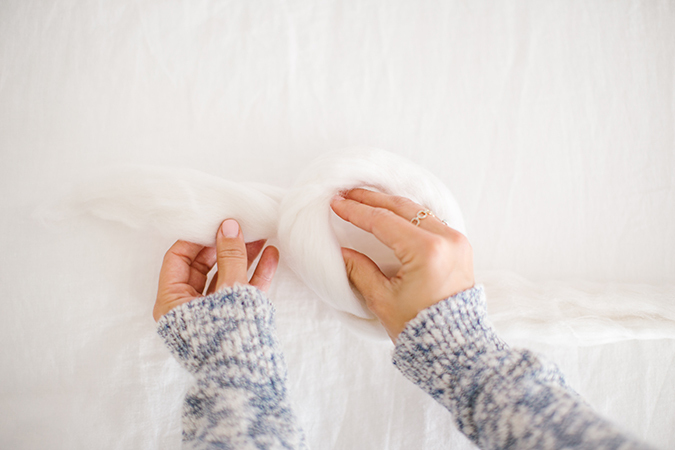 You do this by placing your working yarn over the end of the yarn. 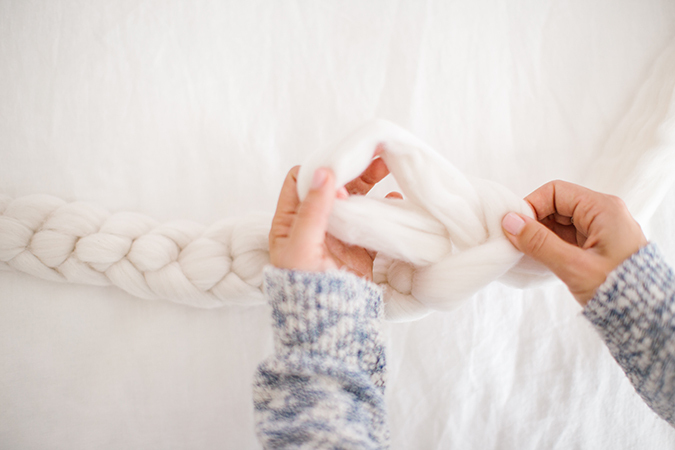 Place your hand inside the loop, grab the working yarn, and pull it through. 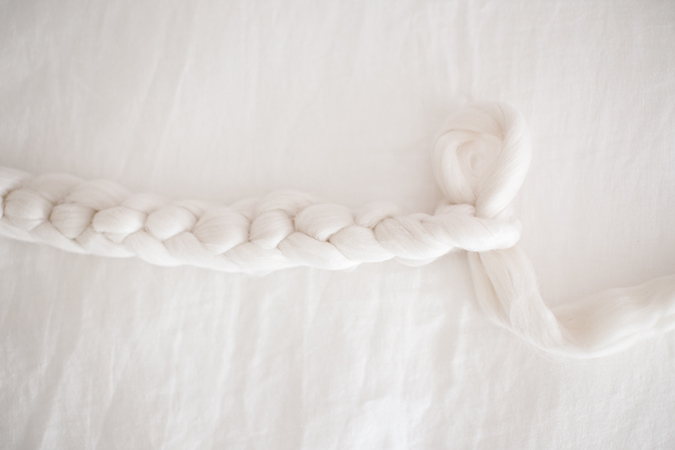 You have essentially just made a slip knot in the yarn. This is your first official stitch. 3. To make the second stitch, put your hand through the first stitch and pull the working yarn through it. 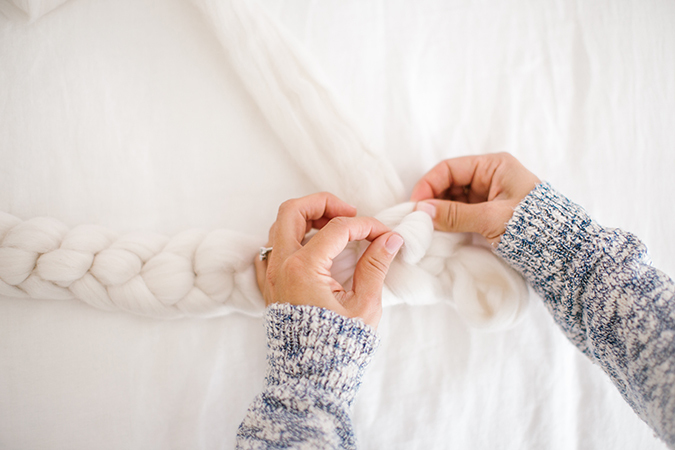 Make a similar sized stitch as your first for consistency. 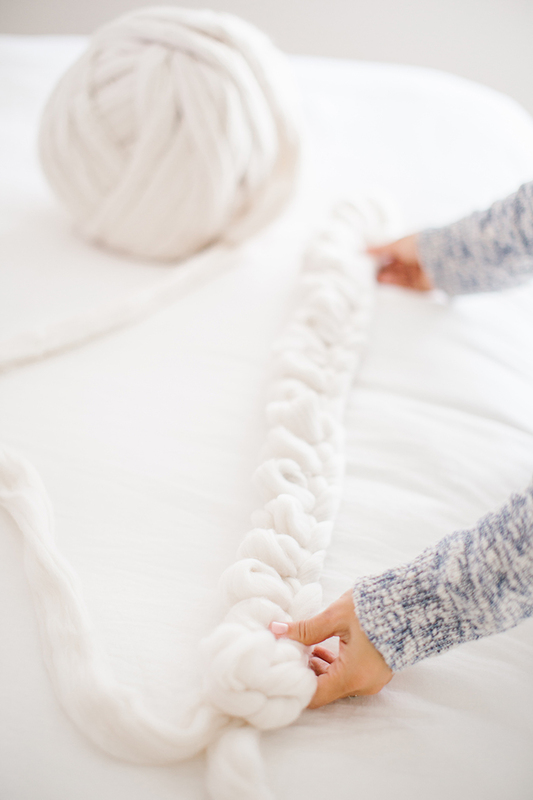 To make a looser chunky knit blanket, make sure not to make your stitch loops too small. To make a baby blanket, make approximately 20 stitches across in your first row. Tip: To count your stitches if you lose track, just count the number of holes you have in the row that you are hand knitting. 4. 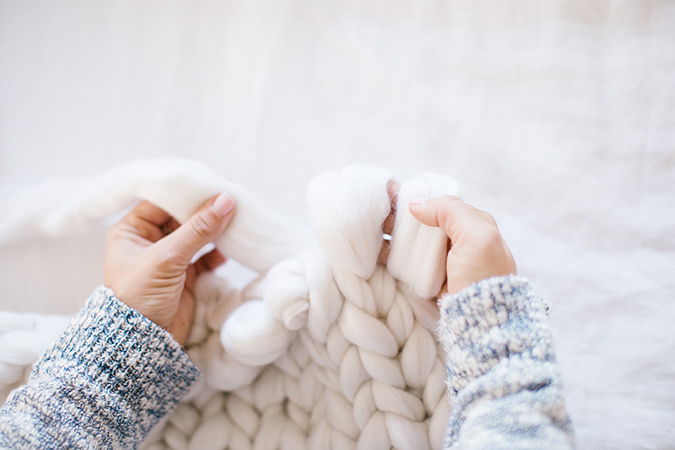 Now that you’ve created a chain of 20 stitches, it’s time to begin the second row of your blanket. 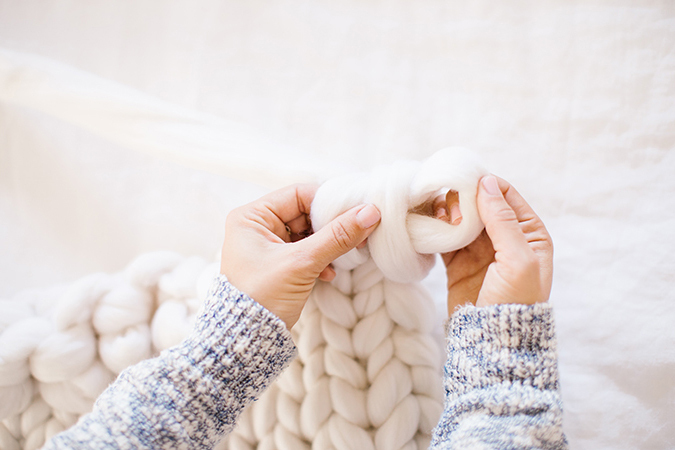 Take the last stitch, put your hand inside the loop, and grab the working yarn and pull it through. Repeat this process by moving left down the chain of stitch holes until you come to the last one again. 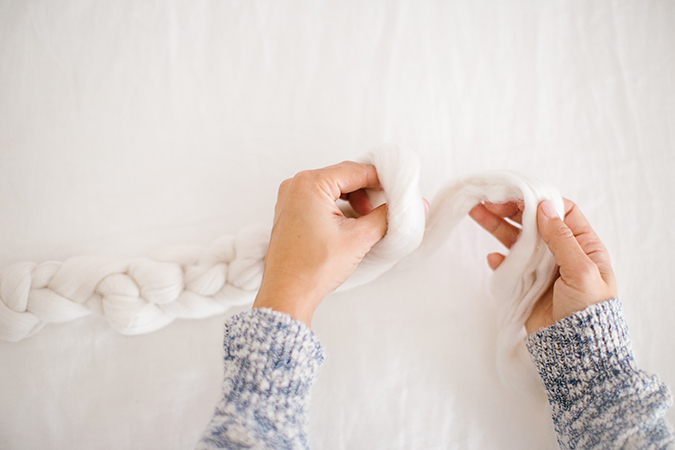 Put your hand through each loop, pull your working yarn through, and repeat for 20 stitches. 5. Repeat number four, except this time you’ll be knitting to your right and alternating every row after. Keep knitting until you run out of wool! 6. 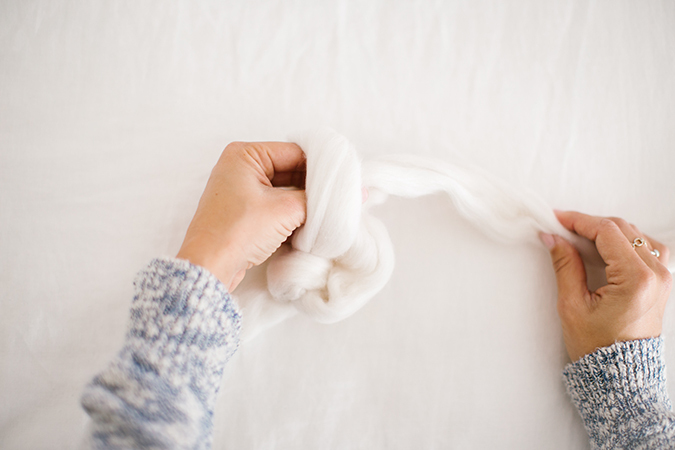 Now let’s learn how to cast off (it’s super easy just like the rest of the blanket!). 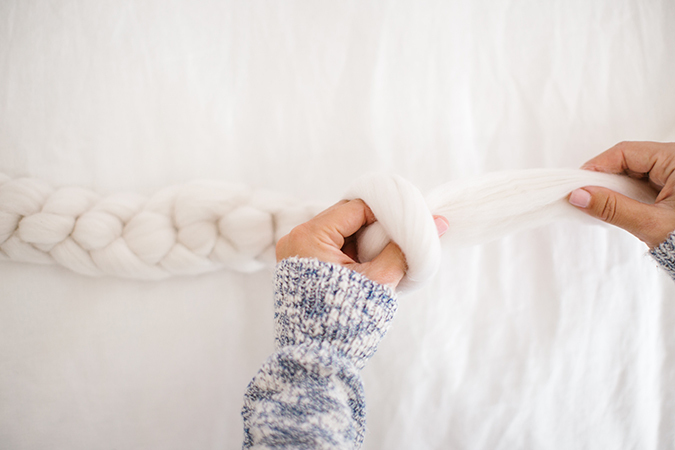 To cast off, take two stitches with the working yarn behind them, put your hand inside the two stitches, grab your working yarn and pull it through. You now have one stitch made from two stitches. Repeat this step by grabbing a second stitch and pulling the working yard through, each time making one stitch from two. Repeat this until you get to the end of the row. 7. 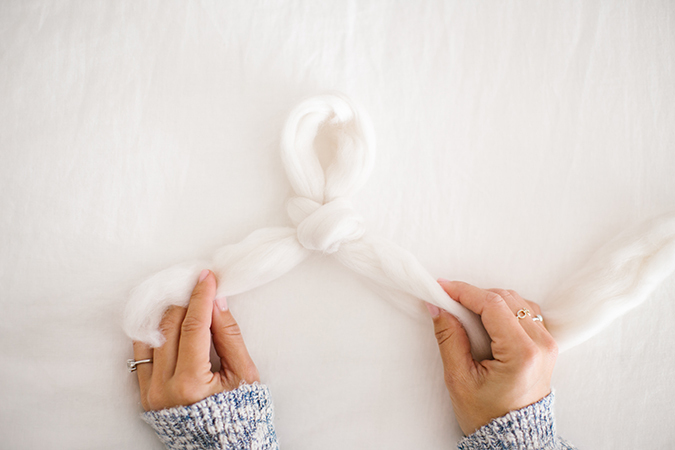 Create your last stitch and use the end of the yarn to tie a knot, completing your blanket. 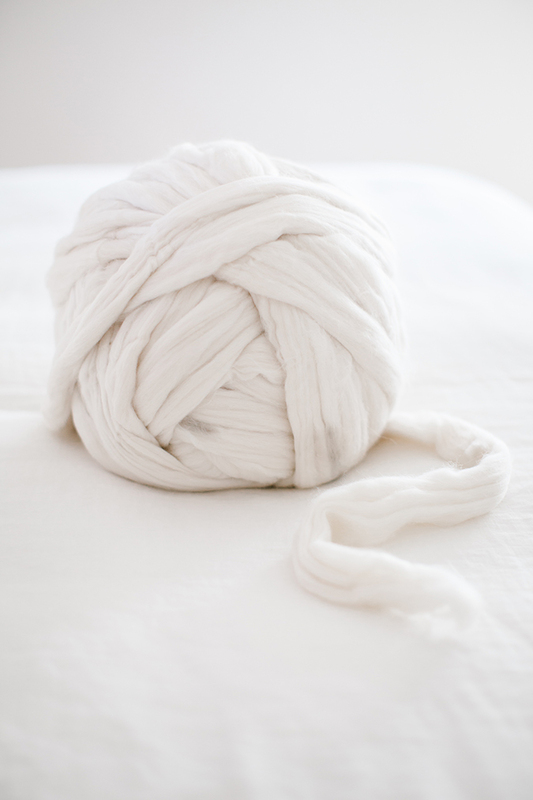 You can either tuck the excess yarn back into the blanket to hide it, or cut off any extra length. Yay! You did it! 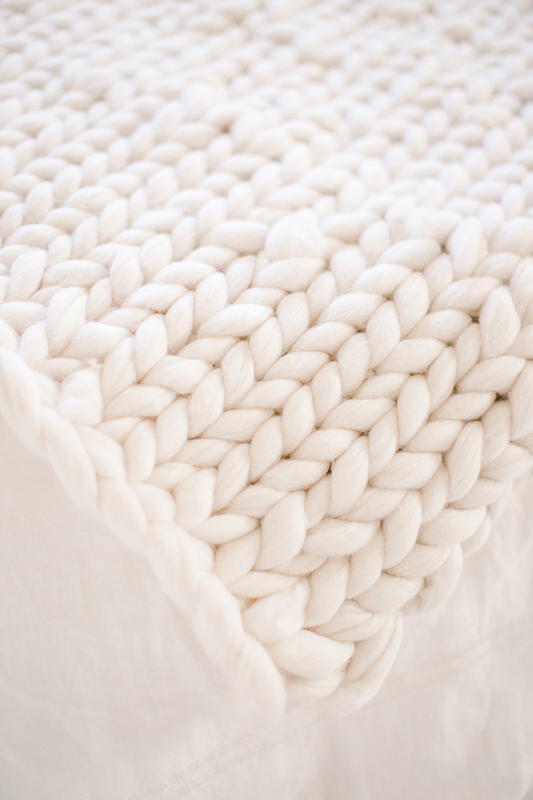 You should now have your very first completed chunky hand knitted blanket. Thank you so much for following along! 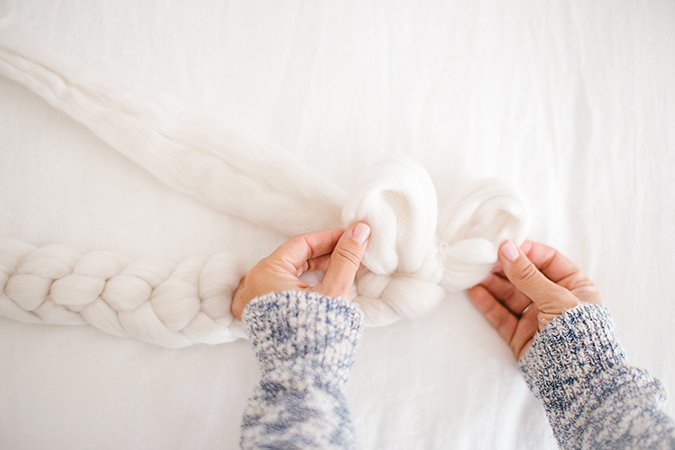 If you’re interested in purchasing wool or a completed blanket, be sure to check out Sarah Lou Co. where I get my supplies! 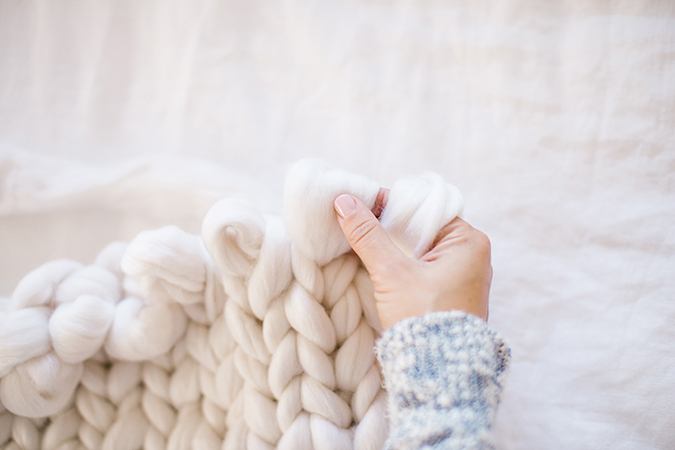 Will you be making your own chunky hand knitted blanket? Did you find this tutorial helpful? Let me know your thoughts in the comments, and don’t forget to share photos of your masterpiece!